Turn the Chocolate Bells with the larger side facing up. Mix the vanilla frosting with orange food coloring (or red and yellow) until it reaches the desired hue. Next, mix in a small amount of confectioners’ sugar to frosting mixture to make the frosting fluffy so it easily holds its shape. 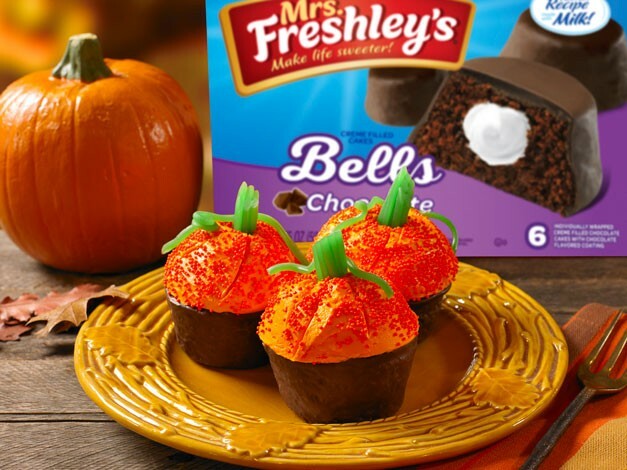 Apply the frosting onto the Chocolate Bells, with more frosting towards the center making a pumpkin shape. Roll the icing pumpkin in the orange decorating sugar or sprinkles until fully covered. Use a toothpick to draw lines in the pumpkin, making textured sections. Cut a two-inch section of the green licorice and insert in the top of the pumpkin making the stem and use smaller pieces of the licorice to make the pumpkin’s vines.